How to win at slot machine "Strawberries"
Passion for computer games can develop into addiction and cause a lot of undesirable consequences. Some people may just say to yourself "stop" and thrust to the games will disappear over time. Others may require the help of specialists (psychologists). In such situations, of course, the invaluable assistance of loved ones, however, you can try to cope with this problem independently. The first decisive step for you is to delete all games, even solitaire and various divination from your computer. Send in the trash all the malicious link, any bookmarks to the game. When you search for information on the Internet on many sites you can stumble on advertising of computer games. Try to concentrate on what you need and not be distracted. It may make sense to install the so-called "bannergate", of course, all this will not solve the problem, but part of the game advertising hide. Bring your attention from the virtual world to the real one. You can start with regular small walks, shopping, outings. Spend more on people, walk, ride a bike. Remember about the main values of life: family, friends. Maybe it is for them to change their way of life. Often meet friends, relax with family, children. Think about that instead of playing on the computer, you can read a story to your child, collect puzzles with him, watch a cartoon or make him something sweet. They say, fight fire with fire. To get rid of one addiction, you can switch to another, more safe and useful. Start drawing owlcotes by quilling, collecting any details. Think about your own musical taste, try to play the guitar or any other instrument, learn a dance, learn the art of photography. Learn to control yourself. You need to be clear about what you expect from yourself and what you want to achieve in life. If you have a craving to play, try to clearly and firmly say no. Describe your day: what you need to do, where to go, whom to visit. Don't leave yourself free time. And if you have one, spend it with benefit for themselves or family. Go to the Park, cinema, theatre, or prepare something delicious for your friends or family. Take care of your health. Join a gym, pool or massage. 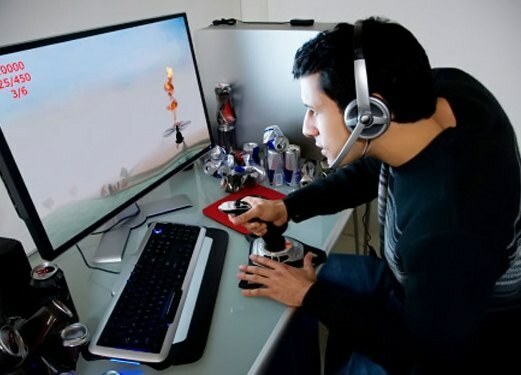 So you will be able to relieve stress and escape from obsessions about games. In an extreme case, consult a psychologist. It will help you to cope with this dependence and to feel free from virtuality.